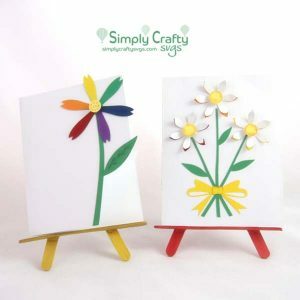 Make this A2 size Spring flower pot box card with the Spring Flower Pot Box Card SVG File. Use it to make a card for a Friend, a quick hello, for Mother’s Day, a Birthday, Thank you, Get Well, or sympathy card. It really is good for anybody that loves flowers. Card flattens to fit into an A2 envelope. If you do not have one, make one using our free Basic Envelope Set.